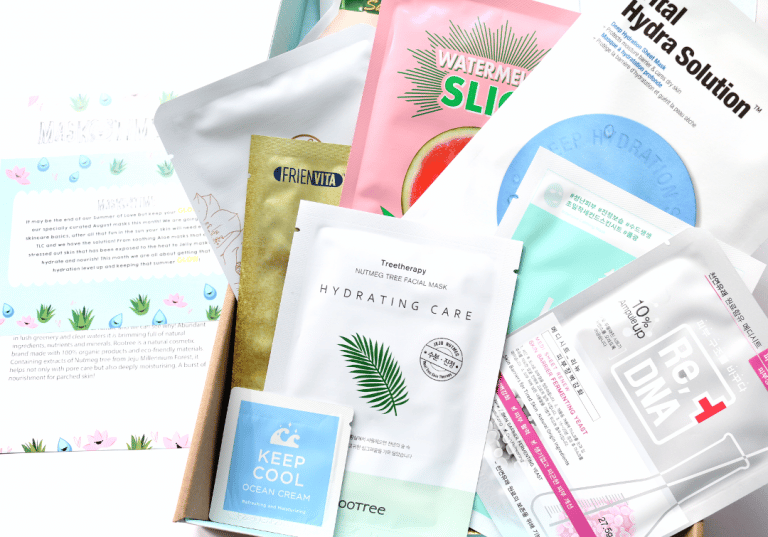 Mask Time is an amazing value-for-money subscription service that specialises in sending you a specially curated box of Korean beauty sheet masks every month. 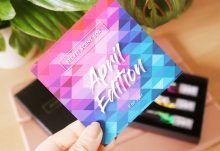 Sheet masks are a fantastic way to care for and treat your skin, so this box is perfect for anyone who loves pampering themselves and would make a great gift idea! 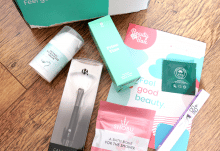 Mask Time has two monthly boxes available and below are the contents of the latest Glow Setter Box which is the largest box that they offer. Let’s see what’s inside, shall we? 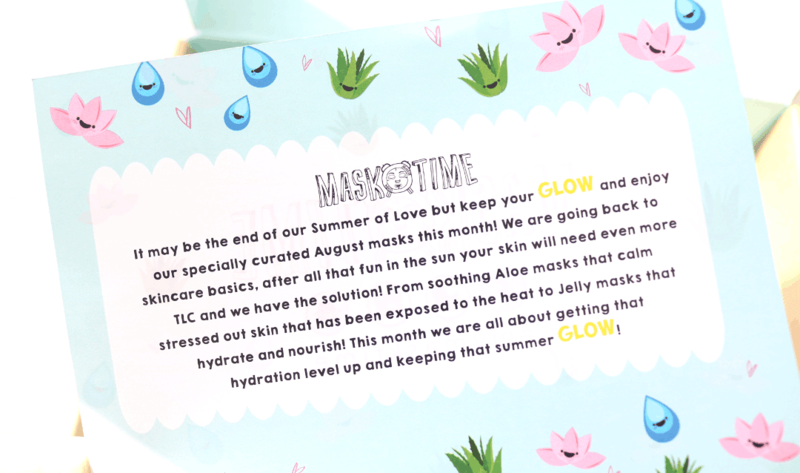 The August theme is all about keeping your skin’s glow after a hectic summer, so what better time to treat your skin to a sheet mask?! Rootree is a natural eco-friendly skincare brand whose products are made from 100% natural and organic ingredients. 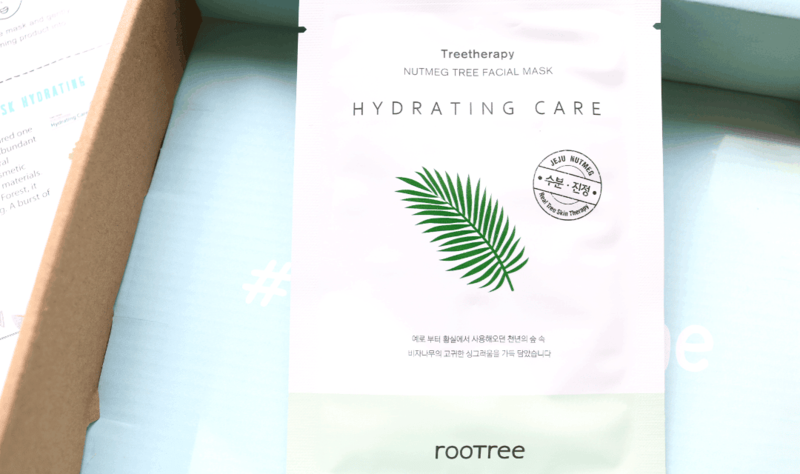 This Hydrating Care Mask features extracts from the Nutmeg Tree that’s found in the Jeju Millenium Forest and is an ingredient that’s famous for its pore cleansing and deeply moisturising natural properties. A great mask to try for parched and dry skin. The next mask is from Daycell and is formulated with Apple Extract, Pectins and Chlorella Extract which are all rich in minerals and contains high concentrations of Vitamins C and A, as well as Potassium which helps to promote cell growth and creates a protective barrier on the skin. This mask is great for deeply moisturising the skin, and also does a great job of soothing any irritation from the sun. Infused with natural forest-derived botanicals, this mask from Adaline is the ultimate pampering and soothing treat for skin that needs some special TLC. Featuring Bamboo extract, Pine, Cinnabar, Ginger Root and Centella Asiatica, it gives the skin antioxidants, has anti-ageing effects, brightens and promotes elasticity and healing. I loved trying this! 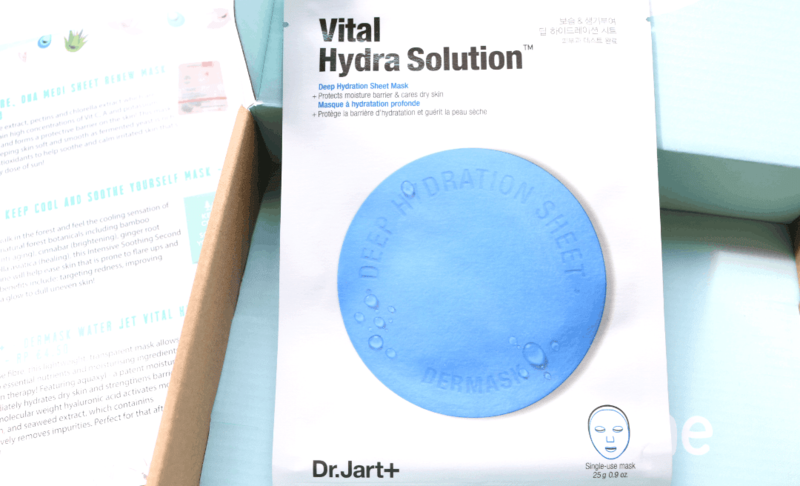 Made from fine cellulose fibre, this mask is lightweight and transparent which allows the pores to fully absorb all of the essential nutrients for the ultimate hydration therapy. It contains Aquaxyl, a unique patent moisturising ingredient which immediately hydrates dry skin and strengthens the barrier function. There’s also Hyaluronic Acid and Seaweed extract to further hydrate and boost the skin. 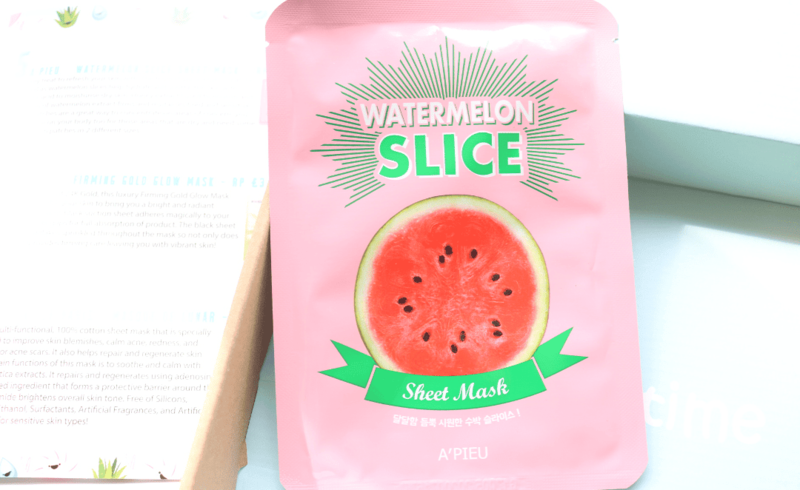 Described as a yummy treat to refresh your skin, the Watermelon Slice Sheet Mask really does live up to its name as it feels amazingly refreshing on the skin. It contains Hyaluronic Acid, Honey extract and 10,000ppm of Watermelon extract to firm, revitalise and soothe tired and sensitive skin. Perfect to use after your summer holiday! 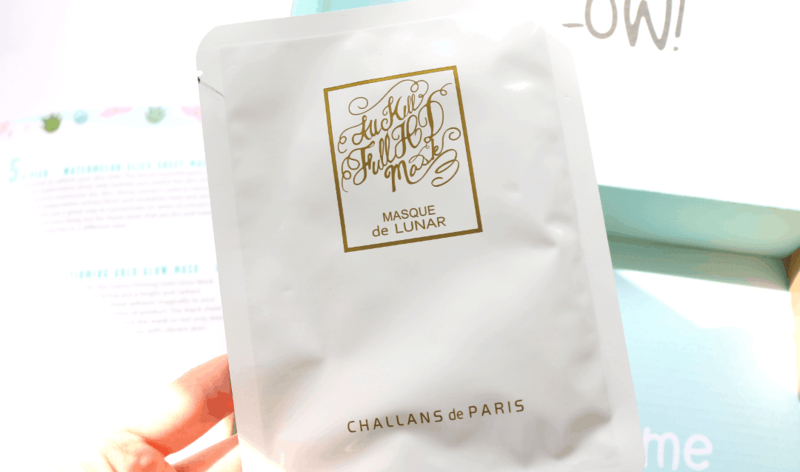 How eye-catching is the packaging for this mask?! 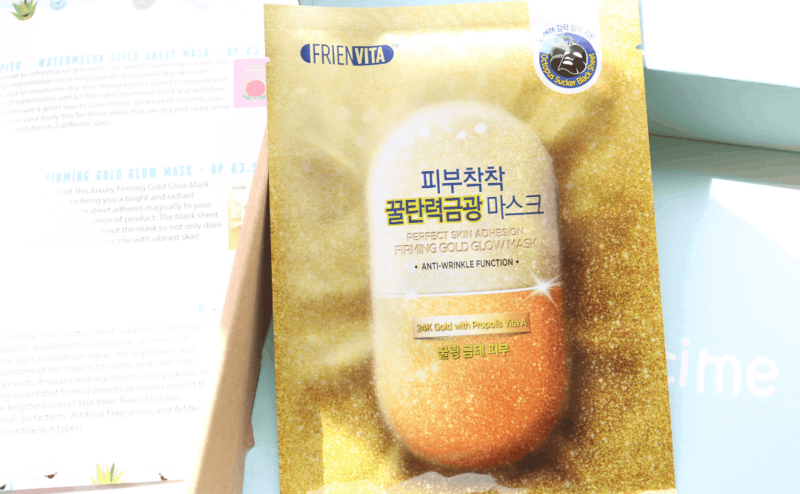 Frienvita’s Firming Gold Glow Mask is infused with 20ppm of real 24K Gold to purify and detoxify your skin, leaving it more radiant and brighter overall. It also has a strong firming effect, so ideal if you’re looking for a luxury anti-ageing treatment. 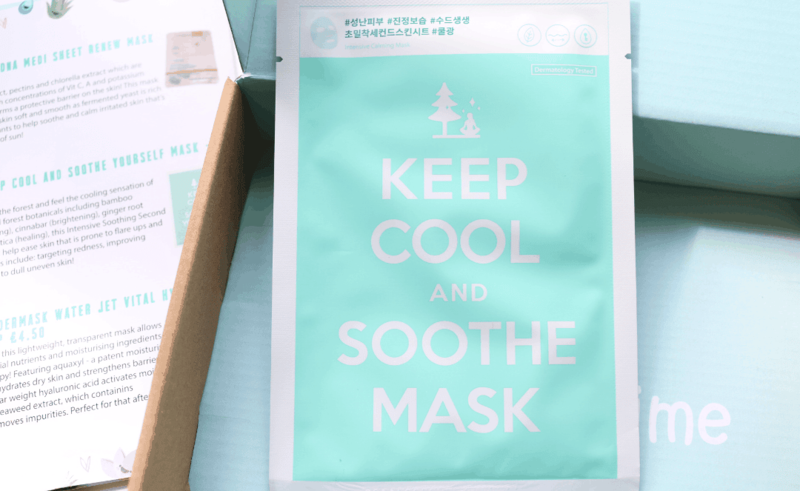 Next is a multi-functional mask which features a 100% cotton sheet that has been specially formulated to improve skin blemishes, calm acne, reduce redness and improve the appearance of minor acne scars. It also helps to soothe, repair and regenerate the skin thanks to a blend of Centella Asiatica and Adenosine. There’s also Niacinamide to brighten the skin tone, and the mask is free from a wide range of nasties including mineral oils, silicones, ethanol and artificial fragrances and colours. Suitable for all skin types – yay! This mask has a special jelly essence that features the key ingredient of Cactus extract, known for its high levels of antioxidant properties that help to protect the skin from free radicals, which in turn prevents fine lines and wrinkles from forming. Other ingredients in the mask include Niacinamide to brighten, Adenosine for wrinkle care and Squalene to prevent UV damage and promote healthy skin cell growth. Who doesn’t enjoy a cheeky Martini every now and then?! This mask features Lime Extract to help rejuvenate tired skin, and its antioxidant properties will also clear away any bacteria that sits on the skin’s service. Green Tea Extract is also included as it contains a powerful antioxidant called EGCC that fights DNA damage from UV rays and makes it a great anti-ageing ingredient, and there’s Olive Extract which is anti-inflammatory and will help to soothe any irritation. 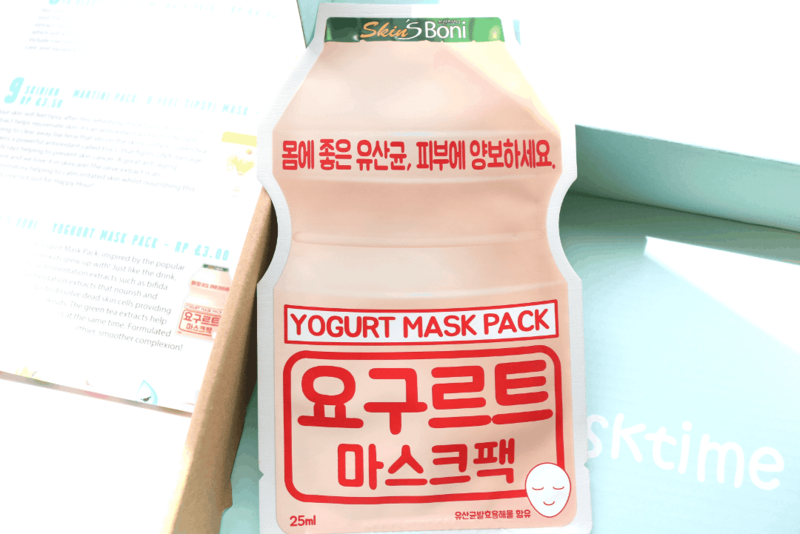 The last mask in this box looks like a bottle of Yakult and is called the Yoghurt Mask Pack from Skin’s Boni. 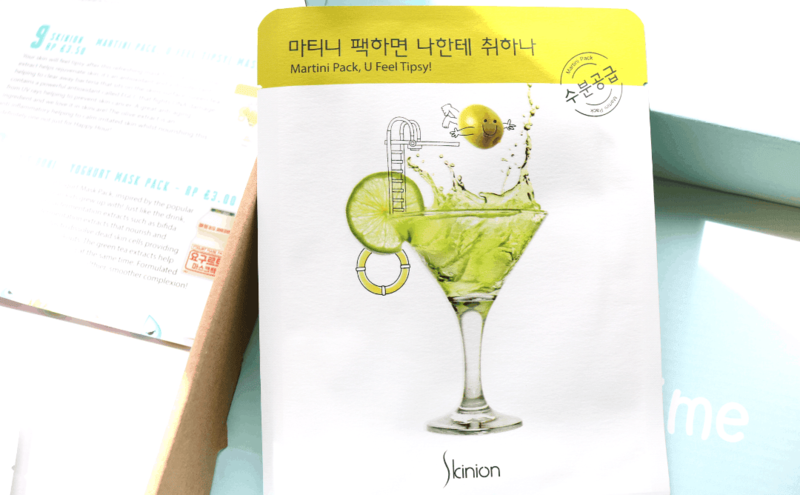 Just like the popular drink that it’s inspired by, this mask contains beneficial fermentation extracts that nourish and hydrate the skin, whilst Lactic Acid helps to dissolve dull dead skin cells, and Green Tea adds nutrients and firms the skin at the same time. The results are a healthier and smoother complexon and who doesn’t want that?! 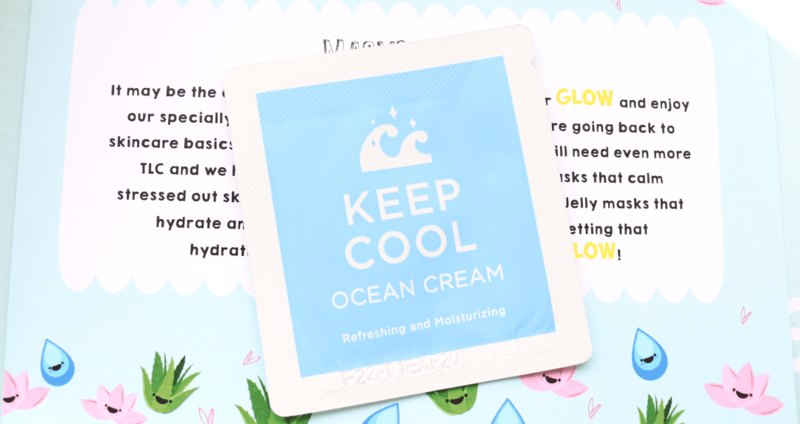 At the bottom of the box I found a sample of Adaline Keep Cool Ocean Cream which I’m looking forward to trying out. 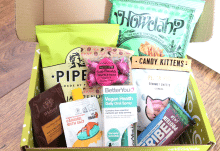 Mask Time's brilliant boxes are always such a treat to open up and I love the selection that they always include!